Why did I name my company Aporia? There are many reasons for choosing a company for a company. Often the name is meant to signify something about the business. Sometimes it is just word that is easy to remember. I chose Aporia for all these reasons, but in some ways, I truly simply chose it because it is one of my favourite words, and it has been since I was first introduced to it in college. Aporia is a ancient Greek word. It written like this: ἀπορία. And it pronounced as a-por-ia (and not a-po-ria). But I don’t really mind how one pronounces it, since to be fair, we aren’t 100% sure we know exactly how the Ancient Greeks pronounced words. The meaning is far more important to me, obviously. And the meaning comes from a few ways I was introduced to it. I am sure many Greek scholars will disagree with my explanation, but this is my story, and why I like this word. I first came across this word in Plato’s dialogues. I was studying at St. John’s College in Annapolis, Maryland between 1990 and 1994. It was a core programme, which means we all studied the same thing; there was no choice of courses we studied. It was based upon the ‘Great Books’ of Western Civilization–a whole bunch of books starting with the early Greeks and into the mid-20th Century. We read a lot of philosophy, math, science and literature. 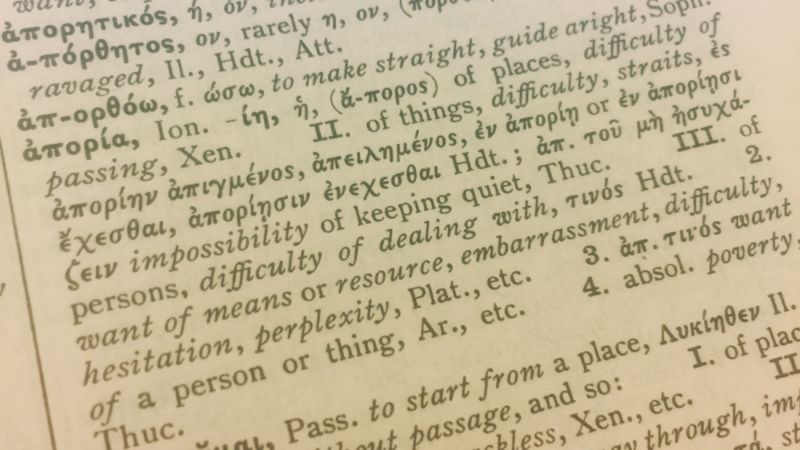 We spent the first two years learning rudimentary ancient Greek, so that we might be able to tease out some insight from what we were reading. That is, with the help of a Greek lexicon. While reading through various parts of a few of Plato’s dialogues, one word became extremely important to me. It was aporia. It is often used towards the end of the dialogues, when inevitably, Socrates and his companions have gotten stuck. They usually start with some suppositions about the definition or understanding of something–like knowledge, wisdom, friendship or love, and then they reach a point in which they have to admit defeat. Their suppositions were wrong. Their attempts to understand failed. It would appear they are right back at the beginning. It is at this point in the dialogue, just before they leave, waving goodbye and looking forward to their next conversation, that they admit that they were not able to truly understand love, friendship, wisdom, knowledge. It seems like such a let-down. And, as if to push it aside so that they can continue on their way, Socrates will state quite bluntly and unapologetically that they are in a state of aporia. They have hit an impasse. This is, in some sense, the best definition. Of course, there is always more to it. Aporia begins with an alpha privative – the ‘a’ or ‘α’ (alpha) that begins the word. It negates the meaning of the root word, namely, poria. Poria comes from poros (πόρος), meaning a path, passage or way. So aporia simply means, no path. Being in a state of having no path, is the very impasse mentioned above. But in this usage, as I came to know it from how Plato uses it, is the very moment when Socrates and his companions might actually be getting somewhere. I believe this state of aporia was never a bad thing, contrary to how it may appear. As many of you might have heard, Socrates was well-known for saying that he knows that he knows nothing. It’s a veritable paradox. Some take it to mean that he is wise enough to know that he does not really know anything. Others see a less than humble pronouncement that he really does understand or know something, but isn’t willing to say what it is. For me, it falls a little in between. After beginning with a supposition, they work towards understanding what they have said, but ultimately (with Socrates guidance) they end up refuting it. They come to see some serious issues in what they thought, and they dispense with their previous ideas (usually). Although they don’t get to where they were hoping to go, they have nonetheless gotten somewhere. This, for me, makes aporia a very powerful idea. The impasse may not be so much a stopping point, but rather a starting place. It is this idea I bring to my company’s name. When people set out to make sense of their information, they need to spend a lot of time trying to understand what they know. I believe that most clients I work with do understand their business. They understand their skills and what they offer to their clients, customers or audience. But within that space of making their information and everything they hope to offer clear to others, they are likely running into some difficulty. This is a state of aporia, and it is a good place, because it challenges them to rethink their assumptions. I set up this business to help people get to that point. I want to help them find their impasse, their state of aporia. The clients that I work with are good at what they do. They know their business better than I could ever hope to. It is not my business to find the solutions to their business. After all, those would be, at best, my idea of what their business is, and most likely those ideas would be incorrect. But I can help them to gather the tools and experience to think through their own information and their own problems with their business online and to help them find a good starting point moving forward.